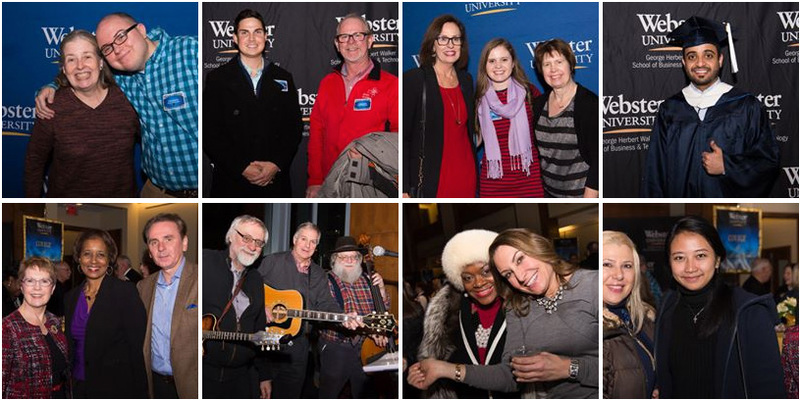 August, October and December graduates of Webster University were celebrated at the December Toast event Dec. 16. The 5th annual December Toast: A Celebration of Our Mid-Year Graduates was held Friday, Dec. 16, in the Community Music School Concert Hall. President Elizabeth (Beth) J. Stroble, Provost Julian Schuster and the deans from each of the schools offered congratulations and remarks to the graduates. Charlie Hahn, vice president of Advancement, welcomed the newest alumni to the Alumni Association, which was founded by a small group of Webster graduates in 1923 to maintain a connection between Webster alumni and their alma mater. "Today, your fellow alumni number 186,000 plus globally and cross all lines of careers and meaningful occupations; harbor a myriad of hopes and dreams; and take pride in their own accomplishments and successes," said Hahn. "Lucky for us, many of these alumni return year after year to continue to enrich the experiences of each generation of Webster students through their dedication of time, talent and resources. As each of you embark on your personal journeys, I encourage you to stay connected, share your stories with Webster University and take advantage of the many benefits offered to you through your Alumni Association." The ceremony was followed by a reception in the Edward Jones Commons on the second floor of the East Academic Building, with music, food and drink, photo opportunities and time to share good wishes with fellow graduates and their families and friends. Music at the reception was provided by Mississippi Crossing, featuring Dan Hellinger, professor of international relations in Webster's College of Arts & Sciences. Click here to view more photos from the event at the University's Facebook page.